Quite large for what is now a small rural market town. 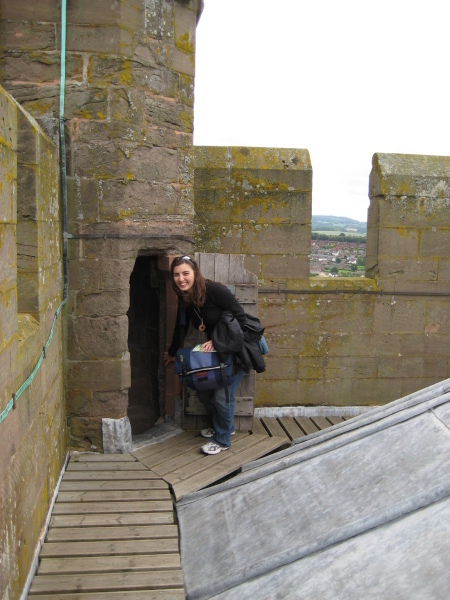 That big bell tower can be walked up, which we naturally did. 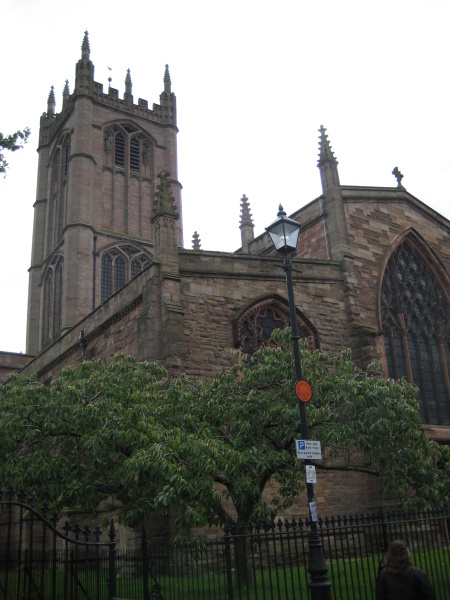 We accidentally timed it for the noon bells which were quite lovely to listen to from above them. Now, I used to have a lot of fear about heights. As I got older, I overcame most of my fears, which one exception: spiral staircases. Alas, they usually lead to some pretty nice places, so I always go up them, but by the end, I’m usually sweating and completely freaked out. This was no exception. Keeping in mind that I’m not a small person, look at Carolyn as she’s about to descend to earth again. 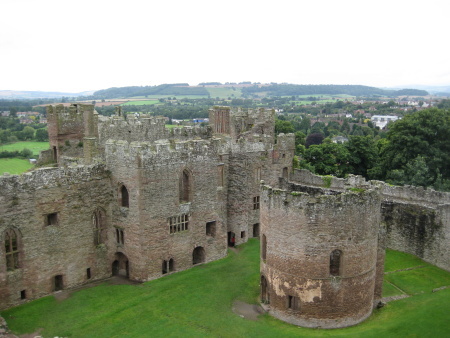 The castle was originally a Norman garrison for the nobleman that William the Conqueror chose to lord of the land in order to keep control of the newly conquered island. 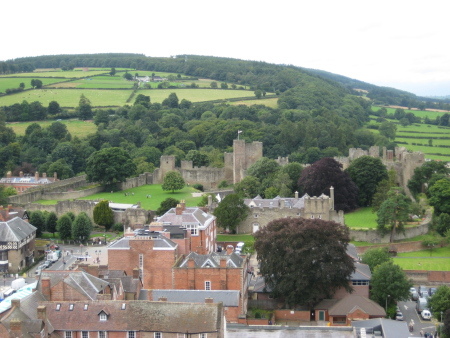 It expanded over the years until Ludlow was controlling the Marches and Wales. 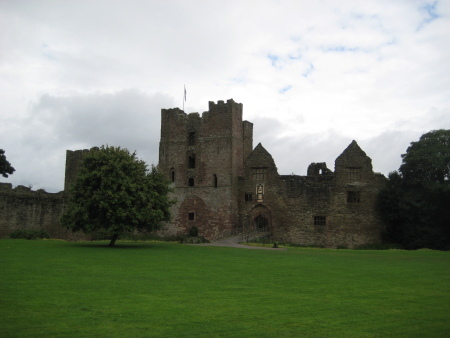 As Ludlow declined in importance, the castle feel into decay. However, castles that end up as ruins can be the most fun to explore. This one was quite impressive. It wasn’t a complete shell of a building which meant there were tons of corners and rooms to explore. And the owners of the castle have left it all quite accessible. I enjoyed it so much, I took about 70 photos just of it. And here they all are!! I mean, here is a small sampling of them. Here is the main exterior of the castle. It’s perched on a cliff above the river (and Mr. Underhils) so it was well placed to ward off any attacks. This is a view from inside the castle itself. 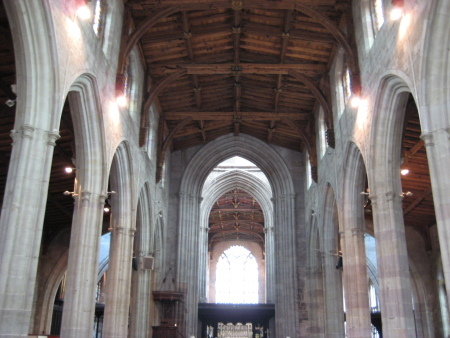 The cool round building was a Norman chapel. It was possible to check out all those rooms off the inner courtyard. This entry was posted on Sunday, October 26th, 2008 at 5:08 am	and is filed under Photos, Travel. You can follow any responses to this entry through the RSS 2.0 feed. Both comments and pings are currently closed. Entries (RSS) and Comments (RSS).18 queries. 0.270 seconds.